The world ends tomorrow... A dream. TSaturn opposition Moon nears exactitude. For an overview of the TSaturn series of forthcoming aspects to the radix, see The Saturn Engagement. The dreamscape is essentially featureless surface-of-the-earth, top of the Northern hemisphere, seen against black starless space. From my non-corporeal perspective at an elevation of perhaps 30-40 feet in the Northeast quadrant, the surface appears to be a gently curved horizontal plane divided left (East) from right (West) by a slightly serpentine stone wall of indeterminate length, approaching 2 feet in width and 3 in height. The light from the unseen sun in the Northwest quadrant makes bright the right hemisphere but leaves the left in comparative darkness, a state of twilight. I am aware of a tremendous amount of activity to the West  I can "see" movement and sense complexity but am unable to "read" specific details beneath the membranous screen that seems to cloak or contain it. I perceive the right as collective reality, a living world of tremendous energy and connectivity in which I do not directly participate but which I know unequivocally communicates with and influences me. As a state of consciousness I approach the barrier, assuming (or entering my) corporeal form along the way, even as, on the other side, an indeterminate number of undefined but (numinous, higher-order) energies or essences move in my direction, coalescing as they go, and, as we both near the wall, their unified presence informs me that THE WORLD ENDS TOMORROW  I hear and feel the words, and I am given to understand that while some few (constructs? mortals?) briefly will survive, none shall remain alive for long. I think this message metaphorical at first, a reference to ideational shift and psychological change, my familiar train of cathartic death and rebirth. But as the words are assimilated, I consider the meaning of physical death. While I have no fear, no dread or anguish at the prospect, I am surprised at the fact of it, the immediacy of the coming event. I know nothing much of substance in general and, here in the left, it seems I have never become actualized in any particular, never really been engaged. Now, in the company of 5 partially manifested companions, beings not fully formed or defined and progressively less visible from their knees down, ankles and feet not seen at all, who float in a loose group about 3 feet above the ground, facing me, their backs to the South, we consider the situation as I hold in the fingers of my left hand and inspect a thick joint of marijuana ... a medicine with which we are all familiar. Interpretation of this dream became easier as I worked through its recountment. The dreamscape itself sets the stage, with black starless space and forms (Mater, Aditi, Lalita, Hekate) brought to light by unseen Sun in the Northwest, here indicating reconnection with corporeal and emotional realities. Division between left and right goes to hemispheric dominance and function, the serpentine division perhaps referring to sushumna, the channel between ida and pingala  all of which were on my mind in the hours leading up to the dream. Right-side activity was dramatically greater than the "less substantial" left-oriented awareness, which may be likened in some respects to Jaynes' bicameral mind, to a kind of parallel consciousness of which I am aware (hear, see, feel) but am not quite able to describe apart form its inherent "authority" or "mastery". Image Credit: Leyla Rael Rudhyar, The Lunation Process in Astrological Guidance. In Rudhyar, Dane. The Lunation Cycle. Aurora, NY. 1967:146. The "floating" beings also seemed numinous; presenting as a group of five, they were more visible to me, not so fully screened, but still not fully seen, perhaps not fully actualized, even as I do not feel substantial in this reality (Part of Fortune in the XIIth). Perhaps the five of the East are equivalent to the coalescence of numinous beings on the other side: 2 x 5 = 10 = Wheel of Fortune, change in time, changing times. The marijuana in the five fingers of my left hand (or was it right? ), again the changing times, and altered states. THE WORLD ENDS TOMORROW... the 27th of December. I'm writing now, on Saturday, the 28th. In context of the The Saturn Engagement, we are very close to exact opposition between transiting Saturn in Scorpio and natal Moon in Taurus; in addition to several contributing aspects, this is a period marked by reduction and reevaluation, reconnection with core priorities and the general focus of existence. The opposition works itself out through the Part of Fortune and Ascendant, both sextile Moon and trine TSaturn. I am of the Balsamic Moon, the Chitra Nitya of Lalita Tripurasundari, the Red Goddess (present in every day of the cycle, within and controling each Nitya1), born on Amavasya, day of the New Moon, which is about 4º 30' from the natal Moon, same degree as Sun, and conjunct fixed star Algol. The Balsamic Moon begins 25 days after the previous New Moon, less than 3½ days before the next  the Soli-Lunar Arc is 315° - 360° (natal Moon is ~ 355º 30', or ~ 9h 45' to NM). Rudhyar's illustration of the Lunation Cycle (above right) shows the Balsamic final phase as "Release". I rather like this very brief description. Created with Astroprocessor ZET 9 Lite, the freeware version of ZET, by Anatoly Zaytsev. Some data and graphic elements added. Click to enlarge. In the radix at left, two kite formations are highlighted. One kite is a very familiar core pattern focused on Venus/Vesta in Aries, showing Neptune R at apex, closely conjunct the Arabic Part of Guidance (Occult) in the IIIrd house; this kite also engages Pluto and Ceres/Chiron R, which form the focus of the second kite, which has the Arabic Part of Change conjunct AMUN at apex in the XIth house; this second formation also engages Pluto and Venus/Vesta. The foci, then, are IXth House Venus/Vesta (the Aries complement, by extension) and Vth House Ceres/Chiron R (the Sagittarius complement, by extension, including Aditi). Centering, harmonizing, working through the "psychic wound", nurturing. The Moons and the concept of Mater are important in this transition. Moon is the Almuten Figuris(→) of the radix, proximal the New Moon, which, as indicated above, occurs some 9 hours after the birth on the same day, Amavasya, ruled by Chitra Nitya, who dispels fears and grants self-knowledge. Moon is square Pluto and biquintile Neptune R, as is Mercury R, closely conjunct Moon. Both kite formations thus engage the Moon, which is sextile the Part of Fortune plus, via Mercury R and Sun, sextile the Ascendant. These are the work-through points for T♄ ☍ ☽. Ascendant is sentagon (100º) both Pallas[Point of Guidance] and Vesta; Part of Fortune in the XIIth is sentagon Venus and biquintile Ceres R[Chiron R]. This is a challenging period in several respects. It happens that TSaturn is exactly trine TJupiter today, and was exactly conjunct the Arabic Part of Identity (PID) yesterday. As may be seen from the chart, an aspect pattern is formed, a minor grand trine (MGT), focused on Juno and the Virgo complement in the 2nd House. The MGT rests upon a mystic rectangle framing a grand trine, one angle of which conjuncts Juno, which is also the focus of a YOD. I'm inclined to apply Juno with respect to intrapsychic relationships among gestalt principals, internal voices and the egoic center. However, during this period of T♄ ☍ ☽, engaging the entire stellium, it is evident that work needs to be done with respect to relationships in the outer world as well. TSaturn is exactly conjunct Zuben Eschamali and the PID in the 4th House, psychological foundations and the home, opposing the stellium in the 10th, profession, social contribution... The work-through involves the complete aspect pattern, including, in addition to the 4th and 10th houses, the 2nd, 6th, 7th, 9th and 12th. The 12th-house material is especially interesting, going to unconscious influences, personal and collective, which engage karmic issues expressed through the Part of Fortune and Uranus, the latter square both lunar nodes  part of the path of solitude I walk. Engaging the PID at this stage goes to re-envisioning place in the world, the nature and degree of involvement by condition and circumstance. TSaturn will retrograde through this region again in June 2014, but then will head through to the 5th house in November; the stage is being set for creative activity, necessarily preceded by identity alignments with respect to matters of health, partnership, and psychophilosophical pronciples. The focus is on the 2nd house, personal resources and values. Deconstructing the box... A dream. Situated in the northeast quadrant of the dreamscape, the narrow building tenanted by a well-known male astrologer appears to constitute its own block, sidewalk all around. I have accepted a challenge, as have others at different times, to deconstruct a cardboard box, a gateway puzzle which, if solved, will enable access to purportedly advanced knowledge. On the west side of the building, near a blue dumpster about midway along, I lay the box in the middle of the empty street and begin deconstruction, pushing the box forward in a crouched, rather crab-like maneuver as I move north. Though I have to look closely when I reach the north end of the building an begin the southward turn, but the breakdown is quite simple. Deconstruction is complete before I spot a pile of finished puzzles beneath the half-open window of the astrologer's office, midway along the east side of the building (opposite my starting point). On the 19th of August my progressed Ascendant formed exact conjunction with radical Saturn. A blog entry at that time dealt with Centaurs and direction, functional multiplicity, archetypes and psychodynamics in a period of transition. The astrological analysis included consideration of a T-square transit: T(♃ ☐ ♅ ☐ ♇ ☍ ♃), as well as the reframing of a core radical opposition and work-through: ♅ Q ♄ ☍ ♃ △ ♅, adding ⚴ to form a kite with Saturn at apex and Jupiter at focus. The analysis was productive, but the reframing marked a conceptual breakthrough regarding the significance of the Jupiter-Saturn opposition. More on that in a bit. At the moment, we remain engaged by T♅ ☐ T♇, having experienced 3 of the 7 instances in this cycle, with what is thought to be the most challenging about to occur in a few days, on the 1st of November, the date closest to the occasion of the heliocentric occurence on 23 November. For the past several days I've been considering the current transit of Saturn, which forms exact opposition with Lilith on 3 November, but, along this path, moving through the final degrees of the so-called Via Combusta, engages a large complement of the radix directly, and the balance by extension. The journey represents a profound, culminating reorientation and change, a consolidation of supraconsciously informed, unconsciously evolving, newly emerging cognitive structures and functional abilities. Ægishjálmr. "Helm of Awe" or "Terror Helm", emphasizing the numbers 3 and 8, and the Eolh (Algiz) rune, a protective symbol and more. See Ægishjálmur: Elhaz [Eolh] protects by connecting a circuit to our spiritual resources. Linking us to guardianship, a sovereign right to exist, for our time here. Pronunciation. See also Ægishjálmr. Left image via Wikipedia; right, adapted. First presented on this site in conjunction with a poima entitled Of common place..., 14 March 2013. I first encountered the Ægishjálmur in Reykjavik, 1969.
with R♄ in , 2nd House, on 19 August, this year. T♄ establishes an aspect pattern with pervasive effect from , 4th House, affecting every other House. T♄ engages ⚸ in opposition, as observed, but is also the focal point in a YOD kite with ⚸ at apex, with inconjuncts to AMUN in the 11th and ⚶-♀ in the 10th. T♄ trines Sirius/Osiris in the 12th and remains weakly trine ♃ in the 8th, squares Persephone in the 7th, sextiles R♄ in the 2nd and Nephthys in the 6th, and is semisextile ♆Rx in the 3rd, Vx and ⚷R in the 5th. The emerging structure appears to involve the number 8, whether as Oktotopos, the Fu Xi trigrams, or the Ægishjálmr, the "Helm of Awe". And of eight I also remember Anansi, a numinous presence in spider form, motionless over a period of days high on the wall of my hut in Strawberry Fields, Jamaica 1984, during a period of deep depression and loss of direction. Originating among the Asante (Ashanti) in Ghana, West Africa, possibly related to Gizo the spider-trickster of the Hausa in northern Nigeria, Anansi is a god, a spider, who sometimes presents as a man. He was messenger between the gods and humankind, and had the power to restructure both the human and the divine world.1 Also known as Ananse, Kwaku Ananse, Anancy, Aunt Nancy, he is a trickster, a wise and skilled communicator, King of All Stories, not just his own,2 able to achieve his objective through cleverness and ingenuity, a paradigm of survival and resourcefulness among the Caribbean slaves whose orally transmitted Anansesem ("spider tales") modeled such attributes and behavior. More than that, the pervasiveness of the Caribbean Anansi represents an indigenous syncretism rather than an amalgamation of diverse cultures.3 It speaks of an evolving ethos. At that time I had no conscious knowledge of this orature and the paradigmatic significance of Anansi, but I certainly needed to experience the message of survival by courage, determination, and wit. I also needed a syncretic understanding of plural personality, rather than an amalgamation or fusion. Anansi presented a numinous presence and indeed, a physical form, that conveyed cognitive structure and stability, that facilitated productive analysis and focused action. A useful remembrance and review at this time. Marshall, Emily Zobel. From Messenger of the Gods to Muse of the People: The Shifting Contexts of Anansi's Metamorphosis. The Society for Caribbean Studies Annual Conference Papers, Sandra Courrtman, Ed. Vol.7 2006. ISSN 1471-2024.
so is ANANSI thus pervasive, universal. James, Cynthia. Searching for Anansi: From Orature to Literature in the West Indian Children's Folk Tradition  Jamaican and Trinidadian Trends. Marshall, Emily Zobel. Liminal Anansi: Symbol of Order and Chaos: An Exploration of Anansi's Roots among the Asante of Ghana. Yankah, Kwesi. The Akan Trickster Cycle: Myth or Folktale? African Studies Program, Indiana University. (1983) ISBN: 0-94 I 934-4308. Marshall, Emily Zobel. Anansi's Journey: A Story of Jamaican Cultural Resistance. Anansi (African god) - Marvel Universe. Patricia Ann Lynch, Jeremy Roberts. African Mythology, A to Z. Great Spirit, personal creator, soul, and changing the destiny  "Calling back the mouth"
Several years ago I read a number of seminal essays by social anthropologist Robin WG Horton, writing in the 1960s and 70s about the Kalabari, a tribe of the Ijaw people in the western Niger Delta. Horton's essays are classics in the anthropology of religion, ethnographically rich and sensitive descriptions of the Kalabari world and belief system. Many ideas he described have stuck with me, including the concepts of opu tamuno (Great Spirit), tamuno (the personal creator, who binds together the spirit and body), and bibibari (lit. "calling back the mouth"), the act of requesting a new destiny. A few days ago I came across a paper entitled Kalabari: A Study in Synthetic Ideal-type, by Nimi Waraboko. I read again of these concepts, as well as oju ("body", representing material objects) and teme (spirits; immaterial agencies), which are known by their effects and can be anywhere and everywhere, in different places at the same time. In the Kalabari belief system, every individual is thought to have a two-part personality, one unconscious (the immaterial soul) and the other conscious (the aware, physical being), acting as separate persons. The soul speaks with the tamuno about the life plan before birth, and, after birth, in life, the aware physical being carries it out, works through the details. If things do not work out, if the destiny (so) seems wrong, the individual may undertake a process called bibibari (nullifying the spoken word, recanting), and the tamuno will effect a new destiny. An oktotopos, an 8-house astrological birth chart erected after Patrice Guinard (1999)1. My adaptation shows different house correlations with eight trigrams (bagua) in the Fu Xi "Earlier Heaven" arrangement showing axial polarization, plus key psychodynamic aspect patterns in the radix. reappraisal, and structural studies of this sort. Note that the 8 houses are prototypic and do not correspond directly with the 12 used in contemporary astrology. The aspect patterns are not contingent on the house arrangement, of course, but they are very interesting in the oktotropic context. My application of the bagua is predicated of inferential utility, rather than the polarization by centralized symmetry Guinard describes. "The daily movement of a celestial body," he writes, "goes through eight successive phases that demarcate eight spatial divisions, eight specific domains, diurnal (positive, open), then nocturnal (negative, closed), according to its position above or below the horizon"; the first four phases are yang (1-2-3-4) and the second four (5-6-7-8), yin. In the yang series, "the body rises and passes the Ascendant" (☳, House 1), "rises above the horizon in the East" (i.e. SE, ☲, House 2), "crosses the point of its maximum height (culmination at the Medium Coeli)" (☱, House 3), "descends again to the West" (☰, House 4), and so on. ☵ with DSC, West Point, and Galactic Center → House 5. "The Portal of Hades". The yang sequence is 8-1-2-3 and the yin sequence is 4-5-6-7. Allen, James P. 1988. Genesis in Egypt: The Philosophy of Ancient Egyptian Creation Accounts. New Haven, CT: Yale Egyptological Seminar. Sethe, Kurt. 1929. Amun und die acht Urgötter von Hermopolis. Berlin: W. de Gruyter. These are heliocentric charts, in Pullen style (lower left), and in Astrodienst Web default style. A heliocentric chart does not include the angles common in geo: AC/DC, MC/IC, Vx/AVx, etc. Houses are replaced by quadrants referenced to the Vernal Equinox (0° ). I find inclusion of the axes (including Caput/Cauda, EP/WP, Vx/AVx) and houses in the Pullen style nonetheless useful in analysis. The Pullen clearly shows a kite with Asc at base, Venus at apex; a minor grand trine: Pluto, Chiron, Neptune; Jupiter square Earth/Moon; and Jupiter opposition Pluto; EP conjunct Uranus, etc. This is of special interest because it seems to present a path of action. Trine Chiron/ADITI, Neptune, Mars, plus sextile PTAH, Jupiter remains viable as the work-through point, but the opposition with Pluto shifts the practical focus to PTAH. The dreamscape initially consists of a long narrow apartment with two windows, West and North; to the East is darkness with no apparent endpoint. The muted bluish-white walls are unadorned, clean gray carpet covers the floor, and there are no furnishings apart from two wooden chairs and a small wooden table set against the North wall near the clear four-paned window. An older man dressed predominantly in forest green tweeds and a matching brimmed hat ( on which I focus ), faded white linen shirt and vest, is seated in the West chair, some of his written works on the table before him. Behind the South chair, I am standing a little to the SE, observing the man as he presents a detailed but not very interesting description of his experiences. I can't accommodate all of the details, which tell me next to nothing about him, and I listen with little attention. An overview might help. Eventually, walking to the West window to relieve my restiveness and gain perspective, I tell him I haven't read any of his writing, apart from this most recent article on the table, and I ask him: What do you write about? philosophy? history? Awaiting his answer, I look out the window. My mood is neutral, and I am without thought or sense of discomfort as I gaze upon the sunlit urban sprawl in this direction. But my mood quickly shifts to anticipatory: I want to hear the old man's answer. From a position somewhat SW of the writer, perhaps 15 feet away, I see him lean back in the chair, tilt his head upward in painful remembrance and self-evaluation. My focus is sharp. I attend him closely. He reminisces, laments: I wrote myself out of the publishing role. And he might as well have added: I am no longer certain of my course. In the hypnopompic state, it was clear that the old man (self image) and the color green referred to Amun, and to Osiris. Study efforts and the most recent psychospiritual crisis, coinciding the Uranus-Pluto square, the Jupiter transit through late Gemini, and the Neptune transit in early Pisces, left me in a state of outer-world incapacitation and nowhere to turn but inward. Apart from brief but nurturing social forays, I felt unusually lonely and separated from the world, something I used to advantage in more ardent pursuit of specific research interests, my astrological studies and analyses. In all other directions I felt restricted. Penury proved a very difficult obstacle, with anticipated funds delayed or denied. On the one hand I was deeply depressed and anxious, while on the other, I was astounded by daily discoveries and insights on problems I'd worked years to resolve. In my dreamscape schema, each of the quadrants provides context for the activities that take place therein. That context is rather different from the astrological schema of quadrants, in which NE is correlated with Personal Identity; NW, with Personal Expression; SW, with Social Identity; and SE, with Social Expression1,2  these correlations are useful in some dream interpretations, and I apply them when they work. In most cases, however, I treat the quadrants as a map of birth through death: SE → SW → NW → NE, usually visualized post-dream with SE at lower right, a vertical and horizontal flip of the traditional astrological natus, but my perspective depends upon where I find myself in the dreamscape. In this dream the West hemisphere holds all the action; that establishes the overall context as end-of-life issues, going to mature focus of activity (SW) and psychospiritual assessment (NW). The old man is a presentment by Self (by which everything sensible) of the egoic crisis, so a numinous image of self, and locus in the NW quadrant makes clear this is presentment is a revelation for purposes of self-evaluation. The old man grieves that he has written himself out of his publishing role, his sense of active identity, and now sits alone in this essentially unfurnished "apartment", poverty or lack of complexity in a state of being apart, without intimation as to what else he might be, do, or pursue. But the color green goes to Amun and Osiris, referring in the latter case to rebirth and in the former, to the hidden Writer  see the last blog entry, second chart: Amun conjunct Rigel, Cursa, and Arabic Part of Art in Gemini. The question of rebirth, identifying new form and course, is difficult. I seem not to know what I'm looking for. The following excerpt was referenced in a recent blog post and is included here to introduce summary findings on review of familiar structures and evolving cognitive frameworks in a plural personality gestalt. Françoise Dunand, Christiane Zivie-Coche. David Lorton, Transl. Ithaca, NY: Cornell University Press. 2005:40. The deities of the polytheistic world were figures of the imaginary realm, endowed with a personal identity, a name, a function, and perhaps a history. Being many, they necessarily had their limits, which is especially perceptible on the level of their function and their power. But the limits that defined them were not impenetrable borders. The definition of a divine entity generally remained rather fluid and was susceptible to modification. Gods could be manifest in different ways to the eyes of those who imagined and represented them, because of what Henri Frankfort has labeled "multiplicity of approaches". There could thus be several appearances or icons, according to the function a deity took on, as well as several names, or a double name, one part of which defined the person and the other the function he or she borrowed from another entity. I have used the word "voices" to refer to inwardly experienced "thoughts" which present as functions of agencies with identity, each sensed as distinguishable from my own yet intimately connected therewith. These agencies are also felt as an internal presence, and are sometimes seen, vaguely or with intense partial clarity (in which case dramatically), yet they are always essentially hidden or screened from me. In the familial and cultural environment of my youth, imagination was useful if it had practical application in observable reality, but generally, it was considered a waste of time. Professional storytellers and artists were seldom seen. The Devil was also unseen, of course, but was nonetheless real to many  "hearing voices" and "seeing things" were almost certainly inspired by Him. In dealing with such internal phenomena, however, self-understanding and growth are better facilitated by acknowledging experience, working with what is there, rather than with what one is told is there. Turns out there's a difference between demon and daimon. How surprising. But then, I seldom found external "authority" reliable in matters of psychospiritual agency, and its record in most other matters often struck me as arbitrary or unjust. I am not much of a follower in the outer world. Inwardly, the process is rather different. The word "veridical" [Latin veridicus, from verum "truth," neuter of verus "true" (see very) + dic-, stem of dicere "to speak" (see diction)]1 refers to a truthful statement, based in reality. It may also refer to "revelations in dreams, hallucinations, etc., that appear to be confirmed by subsequent events".2 So, if one hears "voices", see visions, or feels presences, how does one determine whether such experiences are veridical? What if they're simply "imaginary"? According to Dunstan and Zivie-Coche, "deities of the polytheistic world were figures of the imaginary realm, endowed with a personal identity, a name, a function, and perhaps a history". That which underlies the imaginative process, though hidden from and ineffable to my conscious awareness, may utilize imaginative process and so enable me to apprehend a new developmentally significant reality. Is that reality one on which we all agree? Yes, internally, clearly, because I must be satisfied that all agencies participate in it for common benefit in gestalt. But is it apprehensible to others, and must they agree? Likely not, and certainly not, respectively. Here are some familiar structures and cognitive frameworks in the current evolution. The transformations of recent weeks, consonant with transits of and in the natal geocentric and heliocentric charts, as well as developments in the progressed, show a shifts of focus from the limited personal, role identification and performance, to the transpersonal, receptive and transcendent, the Galactic Center and Aditi . This period of intense study and analysis appears to have reached the necessary end. Relieved of stress, I cannot explicate the answers so very apparent in the way I feel. I'm ready to get back to the painting and poietics. 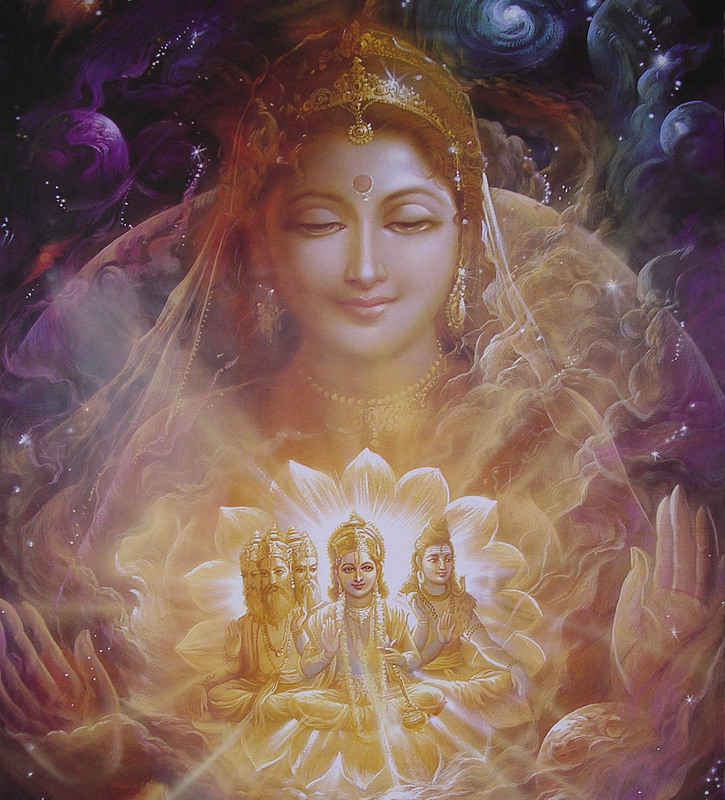 The goddess Aditi is unique, the personation of "infinity, especially the boundlessness of heaven, in opposition to the finiteness of earth" and "universal, all-embracing Nature or Being. "1 Not associated with any other natural phenomenon, she is the goddess of the Void, from whence every existing form and being unfolds. She is mother of all the gods. Motherhood, writes David Kinsley (1998:9), is perhaps her most outstanding attribute. "She is preeminently the mother of the Ādityas, a group of seven or eight gods which includes Mitra, Aryaman, Bhaga, Varuna, Dakşa, and Amśa", but she is also mother of Indra, of kings, and of the gods. In the Ŗg-Veda, she does not have a male consort.2 I've presented some compelling material below, regarding Aditi, but I'm also interested in a comparison. Amun is a promordial Egyptian god whose name is usually translated as "the hidden one" or "the secret one". He created himself and then, everything else, remaining distanced and separate from the world, an inscrutable and indivisible creator.3 In the Old Egyptian pyramid text, Amun and consort Amaunet are of the ancient Ogdoad of Hermopolis, and represent hidden powers, the primordial concept or element of air or invisibility. His consort, Amaunet, is regarded as the life-bringing Northern wind, and is referred to as 'the mother who is father', in which capacity she needs no husband. 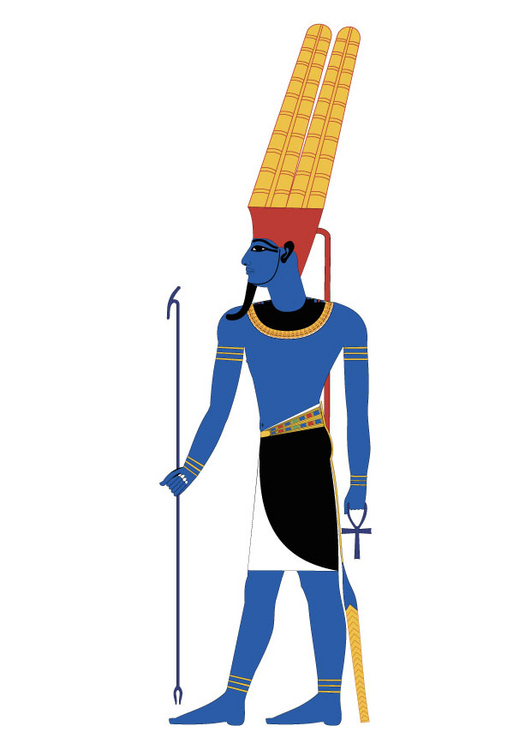 Amun subsequently ascends to national importance when merged with Ra, the Sun god. From the 16th through 11th centuries BCE, Amun-Ra is the supreme, transcendental, autogenic creator deity, champion of the poor or troubled, central to personal piety; other gods are manifestations of him.4 Their stories are his story. There are many parallels here. Accessed 22 March 2013. Links, additional-source content, and emphasis added. Aditi (Sanskrit अदिति (limitless), from "a" (alpha privative) + "diti" (bound), from Proto Indo-European root "da" (to bind)]. Unbounded, free; as a noun, infinite and shoreless expanse. In the Vedas, Aditi is devamatri (mother of the gods) as from and in her cosmic matrix all the heavenly bodies were born. As the celestial virgin and mother of every existing form and being, the synthesis of all things, she is highest akasa. Aditi is identified in the Rig-Veda with [Vāc] (mystic speech) and also with the mulaprakriti [(Sanskrit) Literally, the "root or origin of nature." The abstract deific feminine principle. Undifferentiated substance.] of the Vedanta [see esp. The Samkhyan Theory of Evolution: "...a theory of creation that begins not with the Absolute Reality itself (as in all the monistic emanationist cosmologies), but with the principle of Unmanifest "Nature" ... an evolution or unfolding rather than an emanation"]. As the womb of space, she is a feminized form of Brahma. The line in the Rig-Veda: "Daksha sprang from Aditi and Aditi from Daksha" has reference to "the eternal cyclic re-birth of the same divine Essence" (SD 2:247n). In one of its most mystic aspects Aditi is divine wisdom. The Goddess Tree Grows. Beth Beurkens 2007 and We'Moon 09. Accessed 22 March 2013.
void, Aditi, is paradoxically also a sun deity. Her domain is "the nothing" no time and no space. Aditi, goddess of the empty form, boundless with possibilities. "I am the original manifestrix, the black being, womb of initiation in the luminous darkness. You are from me. I welcome your visits to my velvety blackness. I am not just a one-time port of call. I am the repeat destination. I hold all and nothing. Stamp your feet. Unburden your heart. Crack open your head. I am the dreaded yet the necessary. Come, meet with me. Pour out all your troubles. They dissolve into the cosmic emptiness. Pick up something else while you're here. How about a little elixir of eternity, some medicine for your soul? Do not worry. That is my healing counsel From the perspective of void, the vastness of creative forms, all is possible. If one way does not work, another will. Let's talk about pain. Your fears. Your hollowness. Your loss and loneliness. Look inside me, now. Are you looking? Yes - see, pain is a device that keeps you distracted, keeps you off center. Sure, it tells you something is wrong, needs to heal, needs to change. But pain can create more pain. Leave it lay. Jump tracks. Get on the healing way, the path of infinite love. Here all things are possible, swimming and floating around in my void. Eventually it's time for labor, birth. You can release your pain in me or you can nurture and feed it. Your choice. There's a lot of life out there. Keep your focus on what you seek. Not on what you are missing. The luminous void paints creation, breathes with wholeness, spaciousness: it supports and comforts you. It's your sacred well. Drink of the dark vastness and be healed. I am Aditi. I am the unborn who gives life to the world. Vaster than vast. You know me. All your yearnings and future possibilities rest in me. Pray to me. Light a dark candle in your soul. I will find you. I never miss. Your breath is my trail to you." Psi experience, psychic capacities may be something we all share and recognize to some degree, but that is not to say they are acknowledged as "normal". Still, we might argue that they are functions of consciousness and our interconnectedness with one another and all things. Maybe these capacities can be developed and controlled by some or any of us. Yogic powers or psychic capabilities called siddhis, meaning "accomplishments" or "attainments" or "perfections", are said to occur on the spiritual path,1 arising without specific focus on them in the course of development. Powers such as clairsentience, clairaudience, clairvoyance, levitation, bilocation, telekinesis, telepathy, miniaturization, materialization, memories from past lives, etc.2 Direct pursuit of these capabilities and powers is also said to be problematic, however, an instrument of maya (illusion)3  the seeker may be tripped up by the desire to acquire these perfections. I'll explore an example of that in a bit. In the following excerpt, Jim Kennedy recounts what he describes as a "psi" experience. Given the lack of concrete evidence, some may find his assertions unfounded, even arrogant and self-serving. But I've had similar experiences, considered similar possibilities, and arrived at similar conclusion. I've also had to question whether I was imagining connections or actually experiencing them. Kennedy JE. Research Articles on Spirituality. http://jeksite.org/psi.htm. During my undergraduate college years, I had many apparent psi experiences that strongly reinforced this interest and sense of destiny. One of the first experiences involved efforts to send "life energy" to a friend from high school who was in coma with a brain tumor. Although I never saw him in the hospital, almost every day for several weeks I would make an effort to establish a "connection" with him and then send "energy." The sense of a successful connection and energy transfer were related to sensations in the region of my heart. We had not been close in recent years and my efforts were motivated by a sense of exploration as well as concern. One morning as I began this practice, I had a clear inner insight that my efforts were actually holding him back from his own path or destiny. On that day my efforts focused on transmitting the message that I was ending contact and wished him well with whatever lay ahead for him. Two days later I learned that he died within a day after this insight. The close timing between my release of effort and his death from a gradual decline over many weeks, combined with the clarity of the experiences for me, made this seem like more than coincidence. I wrote earlier about the possibility of imagining connections, in the absence of real evidence. My use of the word "imagine", in this context, goes to the conscious or unconscious creation of content. I want to look briefly at the definition and etymology of "imagination", the verb "imagine", and the word "image" as noun and verb. My question also goes to whether imagination, which seems obviously different from psi or psychic phenomena, might nevertheless arise from the same source. Let's think of psi or anomalous cognition as consistent with siddhis, which are instances of "supernormal perceptual states" that represent natural human abilities attained or expressed under certain circumstances. But let's also presume that, as with other human abilities, people display different degrees of capacity. Source: Online Etymology Dictionary. Accessed 19 March 2013.
from Old French imaginacion "concept, mental picture; hallucination,"
from Latin imaginationem (nominative imaginatio ) "imagination, a fancy,"
mid-14c., "to form a mental image of,"
from Latin imaginari "to form a mental picture to oneself, imagine"
from imago [...] Sense of "suppose" is first recorded late 14c. c.1200, "piece of statuary; artificial representation that looks like a person or thing,"
from Latin imaginem (nominative imago ) "copy, statue, picture,"
from stem of imitari "to copy, imitate". Meaning "reflection in a mirror" is early 14c. The mental sense was in Latin, and appears in English late 14c. Sense of "public impression" is attested in isolated cases from 1908 but not in common use until its rise in the jargon of advertising and public relations, c.1958. The fact that I "see" an image or "hear" a "voice" purportedly providing me with information about a given subject, the death of a person's beloved aunt, for example, just this moment, some hundreds of miles away, is no guarantee that said information is veridical. If I report what I've seen or heard in that circumstance, even were the information later confirmed to correspond with real-world events in every detail, the question must yet arise as to what my purpose might be in such an act. The ethical concerns are significant, here, whether my pronouncement regarding the demise of the beloved prove accurate or not. If I forced the issue in an effort to derive benefit from the demonstration of psychic awareness, analysis proceeds in one direction; if I acted without intent to benefit, if I were moved by unconscious process, analysis proceeds in another. That's interesting, but it doesn't address the question of imagination and psychic process. This next bit does, I think, going to the matter of will and what is variously referred to as the "preconscious mind", the "collective unconscious", the "numinous element", or the "subjective mind". It's been internalized and engaged  instantly activated in some variation I can't yet describe  I'm still digesting the perspective in the context of the personal-transpersonal gestalt, even as the ramifications become increasingly evident in my perceptual field. In personality experienced as plural, where each principal is apprehended simultaneously personal and transpersonal, where "I" appear to arise from, represent and mediate among those principals under aegis of Self, it is not difficult to appreciate the concept of wholeness in contrast to fragmentation. One as Many, Many as One, in this context, is fundamental in my experience-knowledge of reality, in my self-world view. But in frequent self-analyses, in psychoactive and psychodynamic deconstructions seeking root cause aimed at relieving conflict and distress to effect harmony and unified action, I've often focused on "separate" characteristics, what distinguishes one "voice" from another by character and message, for example, intent, emotion, location, etc. The new form of insight can perhaps best be called Undivided Wholeness in Flowing Movement. This view implies that flow is, in some sense, prior to that of the 'things' that can be seen to form and dissolve in this flow. One can perhaps illustrate what is meant here by considering the 'stream of consciousness'. This flux of awareness is not precisely definable, and yet it is evidently prior to the definable forms of thoughts and ideas which can be seen to form and dissolve in the flux, like ripples, waves and vortices in aflowing stream. As happens with such patterns of movement in a stream some thoughts recur and persist in a more or less stable way, while others are evanescent. We proposed that a new notion of order is involved here, which we called the implicate order (from a Latin root meaning 'to enfold' or 'to fold inward'). In terms of the implicate order one may say that everything is enfolded into everything. This contrasts with the explicate order now dominant in physics in which things are unfolded in the sense that each thing lies only in its own particular region of space (and time) and outside the regions belonging to other things. Thus art, science, technology, and human work in general, are divided up into specialities, each considered to be separate in essence from the others. Becoming dissatisfied with this state of affairs, men have set up further interdisciplinary subjects, which were intended to unite these specialities, but these new subjects have ultimately served mainly to add further separate fragments. Then, society as a whole has developed in such a way that it is broken up into separate nations and different religious, political, economic, racial groups, etc. Man's natural environment has correspondingly been seen as an aggregate of separately existent parts, to be exploited by different groups of people. Similarly, each individual human being has been fragmented into a large number of separate and conflicting compartments, according to his different desires, aims, ambitions, loyalties, psychological characteristics, etc., to such an extent that it is generally accepted that some degree of neurosis is inevitable, while many individuals going beyond the 'normal' limits of fragmentation are classified as paranoid, schizoid, psychotic, etc. Interview with David Bohm at the Nils Bohr Institute, Copenhagen, 1989. [I]f we regard our theories as 'direct descriptions of reality as it is' [rather than as ever-changing forms of insight, giving shape and form to experience in general], then we will inevitably treat these differences and distinctions as divisions, implying separate existence of the various elementary terms appearing in the theory. We will thus be led to the illusion that the world is actually constituted of separate fragments and, as has already been indicated, this will cause us to act in such a way that we do in fact produce the very fragmentation implied in our attitude to the theory. Everything changes. Panta rhei. Everything is in flux. Everything flows. The early Taoist theory of Yin-Yang employs a dialectical logic to explain relationships and patterns of interaction, the nature of this flow, of parts and the whole. The approach is naturalistic, examining qualities and conditions. Yin and Yang are opposites, describing relative aspects of a given phenomenon. For example, "time can be divided into night and day, place into earth and heaven, season into inactive periods (fall and winter) and active periods (spring and summer), species into female and male, temperature into cold and hold, weight into light and heavy, and so on". Source The web that has no weaver: Understanding Chinese medicine. The character of Yin originally meant the shady side of a slope. It is associated with such qualities as cold, rest, responsiveness, passivity, darkness, interiority, downwardness, inwardness, and decrease. The original meaning of Yang was the sunny side of a slope. The term implied brightness and is part of one common Chinese expression for the sun. Yang is associated with qualities such as heat, stimulation, movement, activity, excitement, vigor, light, exteriority, upwardness, outwardness, and increase. There are five key principles to the theory. Two aspects are found in all things  a Yin and a Yang aspect. Yin and Yang mutually create each other, control each other, and transform into each other. Click image for write-up, below. Because Yin and Yang create each other even in the most stable relationships, Yin and Yang are always subtly transforming into each other. This constant transformation is the source of all change. It is a give-and-take relationship that is life activity itself. In the dynamics of the body, the nature of transformation can be illustrated by the manner in which inhalation is followed by exhalation, or periods of activity and exertion must be succeeded by nourishment and rest. In normal life such regular transformations occur smoothly, maintaining a proper, healthy balance of Yin and Yang in the body. In a relationship in which Yin and Yang are unbalanced for prolonged periods of time or in an extreme manner, the resulting transformations may be quite drastic. Harmony means the proportions of Yin and Yang are relatively balanced; disharmony means that the proportions are unequal and there is imbalance. A deficiency of one aspect implies an excess of the other. Extreme disharmony means that the deficiency of one aspect cannot continue to support the excess of another aspect. The resulting change may be rebalancing or, if that is not possible, either the transformation into opposites or the cessation of existence. Numerologically, the five tarot cards shown at right are part of the same group or constellation, the Constellation of the Magician: 19-10-1, in this case, where card numbers all reduce to One (I = 1; 10 = 1+0 = 1; XIX = 1+9 = 10 = 1+0 = 1). Additional minor arcana populate this set, of course, including the Aces of Wands, Cups, Swords and Pentacles, the 10 of Cups and the 10 of Pentacles. In today's meditation, however, the 10 of Swords and the 10 of Wands are of particular interest. The former deals with an unequivocal ending and implicit transformation; the latter suggests efforts to maintain the status quo, thus increasing internal tension in resistance to needful developments. The Wheel (X) symbolizes the essence of this transformative process, the inevitability of change. Magician (I) represents mental focus, will and determination, the capacity to channel energy in pursuit of desired results. Sun (XIX) is unified consciousness, wholeness, achievement, revelation. The 10 of Swords presents an image of death  the most definitive in the entire deck. The point has been made TEN times, down the length of the spine. This person is dead and departed. The scene suggests retribution, or a ritual statement of another sort. General interpretations include sudden misfortune, ruin of plans, death in battle, legal battle lost, back-stabbing, termination, the end, you've hit rock bottom ... things can't get any worse, they can only get better. The image evokes a feeling of utter finality: I am stopped in my tracks, stunned by the figure's absence of vital spark, the emptiness of the corpse. What I see and feel is an absolute end of activity along the line of previous action, no grieving at an absolute loss, but the abnegation of an ego identification, complete decathexis, with transcendence, a shift to new (or forgotten) reality, beyond the limits of the previous identification or experience. Here's another take on the imagery: The spine has been pierced at points of connection with the "etheric double" and the 10 chakras identified in Theosophy  we commonly think of 7 but Theophosists identify 3 more, located in the lower pelvis, used in black magic. So here we have an extinguishment of the flow of energy, effected by the blades (excess metal = too much e.g., of any or all of these: analysis, definition, discrimination, synthesis; emptying, inhibiting, contracting, descending  resulting in congestion or depletion of Qi; see Beinfield and Korngold, 1991:215) and marked by sword-hilt crosses glowing white to indicate the light of super-consciousness, which penetrates the mysterious unknown of the black abyss. There is now a balance of conscious and unconscious awareness shown by the yellow sky and blue water in equal proportions, air and water, intellect and emotion. The lower body is draped in red, held fast by six swords, indicating a severing of egoic attachment and passions, thus enabling heightened discrimination. If one were previously disinclined to let go and decathect the ineffective, that clearly is no longer the case. It is done. Compare that with the symbolic implications for 10 of Wands, where one attempts to preserve and protect an ego identification (continuing with our 10-of-Swords theme), establishing a spiritual perimeter around oneself to avoid the demands of material reality, or, alternatively, taking on too many responsibilities, becoming overburdened. The effort represents a containment or repression of energy, an arresting or infolding of development, a focus on limitation rather than flow and balance. Too many creative aspirations on a slow road home. Yin ⇒ Yang, a transcendence and restablishment of balance. The Magician and Sun are important in this, going to the will to manifest Self (Shen) revelation. The usual work, but now understood in new light. The ideational shift is 9 → 10 ⇒ 11, leading to profound differences in creative expression and communication. Stuff I'm still working on, but with a more relaxed and at-peace appreciation of the process and initiative. IChingOnline.net, with original material by Richard Wilhelm. This is an excellent free service. You can also save your readings online for a nominal subscription ($12/6mo, $18/yr). I'm quoting the following reading in full, in illustration of its caliber. The Superior Person will stake his life and fortune on what he deeply believes. Triumph belongs to those who endure. Trial and tribulation can hone exceptional character to a razor edge that slices deftly through every challenge. Action prevails where words will fail. Only transcendence to a new existence  a higher plane of being  will see you through. You can't return to it. The Be(e). Acrylics on canvas. January 2013. One of the pieces completed during this period. with being, and with the bee. And see, e.g., Beasts of Albion, Miranda Gray. The Bee's hive is the order of the universe. and the order within your own life. I have been working through a period of internal examination during which error after error presents in what seems to be random review, though perhaps I simply miss the connections among them in the pain of my reactions, the shame and embarrassment, the sense of utter failure, and the desire for death. I would call them abreactions, a reliving of experience in a type of catharsis, but the sequences of memory are neither relieved nor extinguished in the process  more of them accumulate with new social experience and are added to the already long list of evidence adduced in indictment of my every and best effort. Interestingly, none of them involve the time I spend alone in my work, only the time I have spent in relation with others. These episodes come in waves of amazing intensity, throughout the day but most acutely in the middle of the night, during which I am unable to effect escape through sleep, distract myself or otherwise dissociate. The memories irrupt one after another, for how long I cannot say because time cannot be measured  is so slow it has no meaning  in what seems to be a judgment of my life in full, and there is no defense whatever against the charges, for clearly I am guilty. Expiation and redemption are not at issue as I begin visualize various and bloody means of self-destruction. When the images become essentially real, when they begin to merge with my will to act, a point of crisis is reached. I have taken determined action in the past  a physical risk, for example, such as climbing a vertical rock face, placing myself in a position that dramatizes my feelings and makes completion of the challenge a "proof" of my competence or worth  but my most consistently effective and utterly driven response is self-analysis, entering a deep-level trance, slicing through the fear and diving toward the root of the irruption. I feel strongly guided in this process, unified with a mighty host, certain of my objective and purpose. Khushi Malhotra, Moving Inward: Tools to Ignite Your Yoga Practice. (12 March 2011) Edited. Link added. One of the stories related to Rishi Angirasa is mentioned in the Mundaka Upanishad. A householder by the name Saunaka carries his firewood and reaches the forest where Rishi Angirasa is. He approaches the Sage reverently and beseeches, "O Holy Sage, teach me that through which the whole universe can be known." Rishi Angirasa explains the two different kinds of knowledge on this Earth. The lower knowledge, he states, are the sciences, hymns, rituals, grammar, poetry, astrology, etc. The higher knowledge is that which leads a man to that which never dies. The Indestructible. Rishi Angiras explains this further, saying "This body is like a tree in which two birds live. They look alike. The lower bird is tasting the fruits of the tree and some are sweet and others are sour. The higher bird is just watching the lower bird. One day the lower bird is tired of everything and starts to weep. The lower bird sees the higher bird which is calm, unattached and at peace. The lower bird hops towards the higher one. It suddenly realizes that the upper bird is also just himself, his true Self. Knowing this, his grief disappears. He realises that the Ego was not real, the Self was real, the observer of all." Such periods of self-diminishment have occurred throughout my life, but they are particularly difficult during this period of transiting ♇ in square transiting ♅ in , conjunct the complement of MC, ☊, ♀ and ⚶. Review and re-envisionment of life purpose seems to me a helpful framing of my experience during these transits. But I've also been exploring Vedic Astrology, the Rashi (Moon sign in the birth chart) and the Nakshatra in which the former is found. Each Nakshatra is a group of stars comprising one of 27 Lunar Mansion of 13º20' each (about the arc the Moon traverses each day), and each Lunar Masion is further divided into 4 padas or steps, 3º20' each, for a total of 108 padas in 360º).1 I was led to  there is always the feeling that I am being shown information in my research, that I am brought to see  material new to me, but precisely relevant to the problems engaged. The analysis that had broken the latest ablative irruptions involved the concept of perfection, the need to be perfect, but the recognition that in absence of comparators, and a hermit has few except in memories of social encounters sometimes long past, there is no means by which to determine a reasonable standard of perfection. My Rashi is 27º35' , in the Krittika Nakshatra, 1st pada. Source: The following material is excerpted from pages 18-19 of The Book of Nakshatras: A comprehensive treatise on 27 constellations. Prash Trivedi, with additions by Christabo (2012). Secondary source: http://www.socionix.com/misc/astro/03%20Krittika.htm. Adapted. "At one point in time, the gods had lost all of their territory to the demons, and in their desperation asked Lord Shiva to help them. Shiva expressed his disability to intervene directly, but promised that he would produce a son who would deal with their problems. There are many different versions on how Karttikeya was actually born [...] However all texts agree with the fact that he was sent away to the Krittikas (Pleiades star cluster) in order to hide him from the demons. The demons had come to know that this child was born for destroying them and were searching all over to find him, so that they could destroy him first, while he was still a baby. Hidden from everyone's eyes, the seven wives of the seven rishis took care of Karttikeya, and as soon as he reached boyhood, he fulfilled his purpose by destroying the demonic forces and restoring the heavens to the gods." [...A]ll of Krittika's nature and functioning can be understood from the above legend. Krittika relates to a sense of imminent danger, which leads to secrecy, seclusion and hiding as a result. It relates to the care and nurturing of anything in its young, delicate State and this is the reason why Moon reaches its maximum exaltation in the second pada of this nakshatra. Karttikeya's heroic valorous deeds are mirrored in its functioning as well. Agni, the god presiding over the "fire" element in nature, is the secondary ruler of Krittika. Fieriness is definitely required for the combative and militaristic nature of this nakshatra, as suggested by the war general post of Karttikeya. The fire symbolism here can be interpreted at a variety of levels. On a physical level it represents the digestive fire, which converts the food we eat into usable energy. This makes Krittika an energetic and physically active asterism. On a mental plane, fire relates to the ability of the mind to assimilate new knowledge. The mental fire constantly seeks knowledge and experience in order to keep itself burning. This nakshatra therefore relates to curiosity and an inclination to venture out into unknown areas. On the astral and more subtle planes, fire relates to the purifying principle in nature. It burns away the karma from previous lives, so that a sense of unity with the original creative source may be achieved. Krittika, on an esoteric level, serves the function of purifying the soul through the fires of knowledge and experience. We must not forget the seven wives of the seven sages, as they represent the actual stars of this constellation. Krittika is a semi-maternal nakshatra and all its maternal qualities come from these seven women. These seven women can in a way be seen as the five senses, the mind and the consciousness. Their child Kartikeya, then represents the limitless perceptivity of the innocent mind. There are many legends associated with the reasons behind the Separation of these wives from their husbands (the seven celestial sages). [...] In the meantime, we just need to acknowledge the fact that these seven wives trained and educated baby Karttikeya in the various Systems of knowledge. This fact reveals the "educational" and "institutional" aspect of Krittika. Krittika is a sort of celestial training ground or university, where one receives training necessary to pursue one's life purpose.